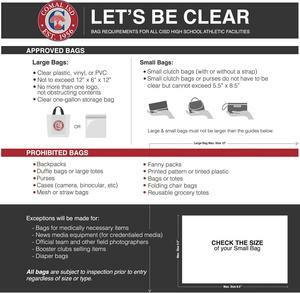 As part of its work to continually improve district safety and security for students, staff and visitors, the Comal Independent School District is implementing a clear-bag requirement for all high school athletic venues beginning Jan. 7. Any visitor, spectator or patron attending an event at a Canyon, Canyon Lake, or Smithson Valley High School’s athletic venue will be required to follow this procedure. The procedure does not apply to middle or elementary campuses, but it does apply to all events hosted at the high school stadium, gymnasiums, baseball, or softball fields. At this time, the procedure does not apply to events hosted in the performing arts centers. 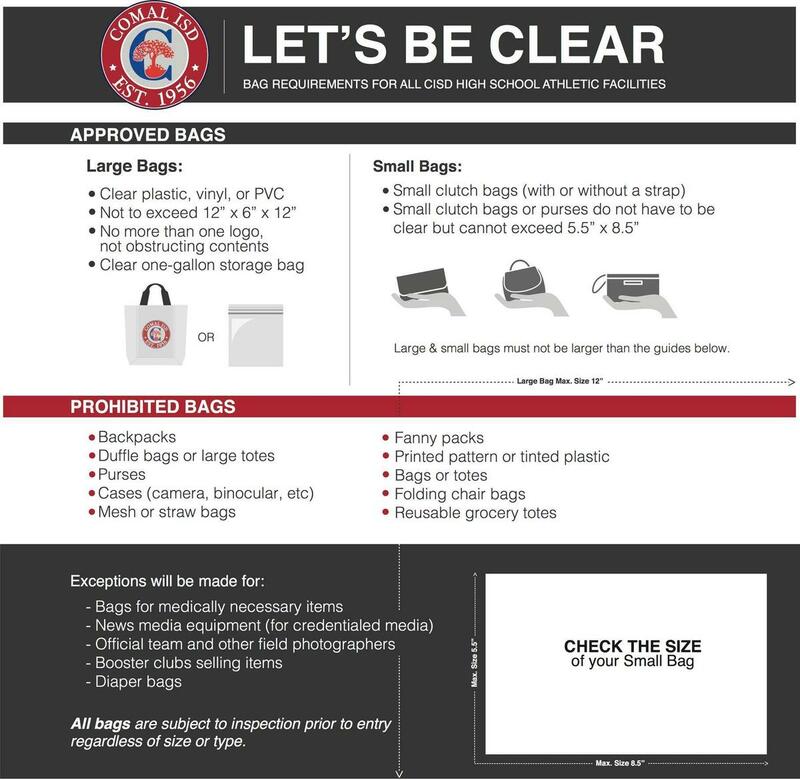 All bags entering these facilities, which are larger than 5.5 inches by 8.5 inches, must be clear plastic or vinyl (one-gallon size Ziploc bags work). They may not exceed 12 inches by 6 inches by 12 inches and have no more than one logo. Logos must not be obstructing to content. Small hand-size clutches or wallets will be permitted but cannot exceed 5.5 inches by 8.5 inches. Diaper bags and medically necessary items will be allowed after being inspected. The only other exception is media and camera bags, which will be searched as well and will only be permissible with credentials. Any guest entering a venue with a nonconforming or prohibited bag will be asked to return the items to their vehicles. Beginning in January, compliant, reusable school-branded clear bags will be available for purchase through individual campus athletic booster clubs.